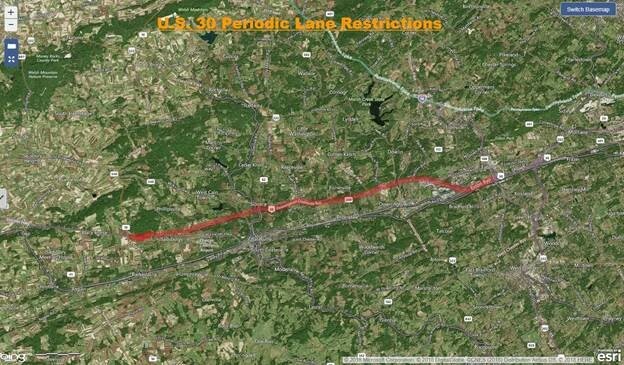 King of Prussia, PA – Intermittent lane closures are scheduled on eastbound and westbound U.S. 30 between Route 10 (Octorara Trail) and Route 100 (Pottstown Pike) in Sadsbury, Valley, Caln, East Caln and West Whiteland townships, Chester County, on Monday, August 20, through Wednesday, August 22, from 9:00 AM to 2:00 PM, for shoulder stabilization, the Pennsylvania Department of Transportation (PennDOT) announced today. Motorists are advised to allow extra time when traveling through the work area. The schedule is weather dependent.